PITTSFIELD — The concept of community isn’t traced by town or county lines. 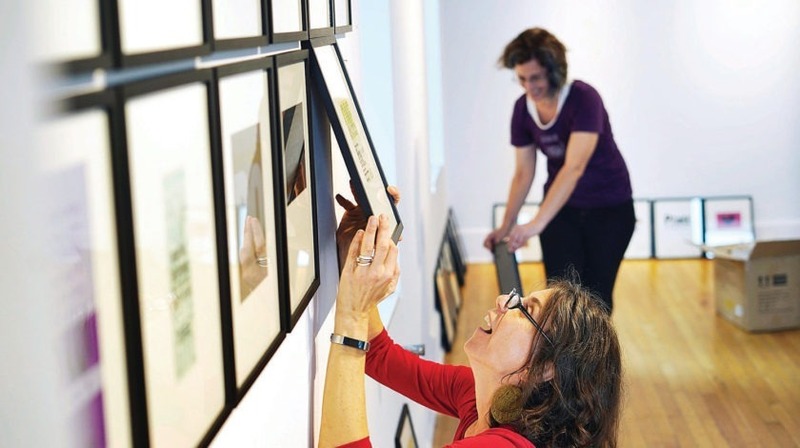 Neither is Berkshire Art Association’s (BAA) biennial juried show “Showing Up: for Your Neighborhoods, Communities and Each Other” which is on view at Pittsfield’s Lichtenstein Center for the Arts through Nov. 16. The display of painted, sculpted, drawn and photographed art represents a bevy of Berkshire-based artists’ work, but the exhibit also includes creators from New York and other parts of New England. Denise Minnerly of Norwalk, Conn., and Donald Bracken of Cornwall Bridge, Conn., collaborated on “Village Project,” an installation that directly engages with the show’s theme. It combines floor-resting clay houses with a collection of hanging vines, the latter serving as an extension of the village. “We’re all tied together in this sort of complicated way,” Minnerly said of this linkage.